In her studio in the village of Shahpur Jat near Delhi, you’ll witness a medley of colourful clothes with rich tribal motifs. In this upscale setting, at work are women artisans from terrorist and war-torn regions who are intensely engrossed in creating intricate designs in madhubani, kalamkari and kantha styles. It’s surreal. But for designer and self-proclaimed emissary of peace, Ashima Singh, this is work; and her love. The seeds of her passion for art were sown in her hometown, Jaipur where she grew up seeing block prints, tie-and-dyes, and embroideries: “When you are from Rajashthan, you know no other way.” During a research trip to a remote region, she was appalled to see beautiful craft neglected and the situation of the local women. That’s when the design graduate from NIFT decided to do something about it. She believes that “Craft is the best option for sustenance of women in violent regions”. When she is not at her studio, she is either reading, reconnecting with old friends or busy travelling to inaccessible locations in India and abroad. What is next? 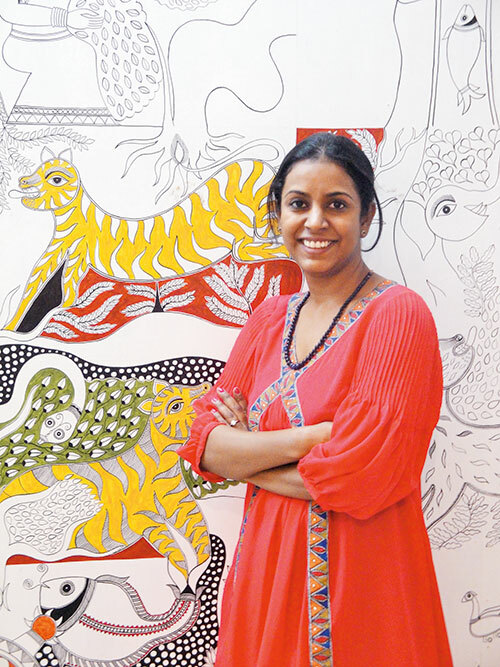 It’s a Madhubani accessory line that she can’t wait to start work on.